I drove out to Zion National Park to spend a weekend hiking with friends, but our athletic plans went astray after the fourth largest snowfall since 1904 slammed the region. The snow just kept climbing–8.5 inches in total–and I felt like I was living in a snow globe! 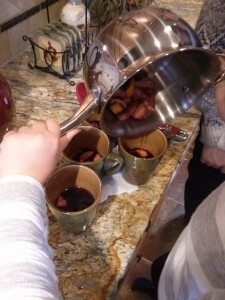 To warm up in this winter wonderland, I decided to make mulled wine. I’ve had a special place in my heart for the cozy beverage ever since I visited Prague, where you can buy mulled wine from street carts and then stroll through a park. I’ll never forget the night I went to a bar in Prague and ordered mulled wine. The bartender just laughed. They said it was like me ordering coffee at a dive bar in the U.S. I switched my order to Pilsner, but the next day I made sure to get mulled wine from a street vendor! 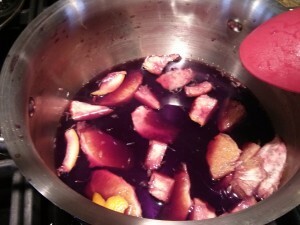 My take is pretty traditional: red wine (Cabernet Sauvignon, Syrah, Beaujolais), orange, honey, cinnamon sticks, ginger, cloves and brandy. We were missing a few of the ingredients, so I had to whip up a little variation, but it came out great. Don’t worry, I’ll tell you about the mile trek in the snow that piled almost as high as my knees to get more wine in an upcoming post. 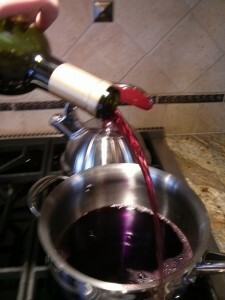 -Poured a bottle of red wine in a big pot, much like the kind you’d used to boil Spaghetti. 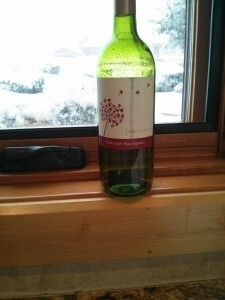 I used Three Wishes Cabernet Sauvignon (You can buy it at Whole Foods for $2.99). I wouldn’t buy the other Three Wishes’ varietals Merlot and Chardonnay, but the Cab is passable, especially if you’re going to use it as a mixer). 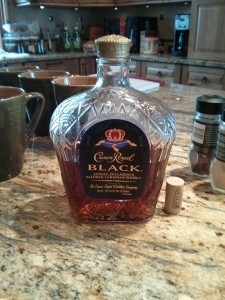 -Poured in a third of a cup of Crown Royal…it was that or Johnny Walker Black and I thought the former would be sweeter. 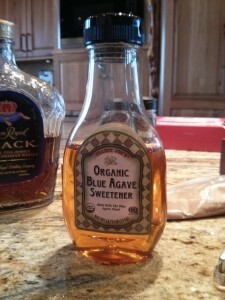 -Added 1/8 of a cup of Agave Sweetener. 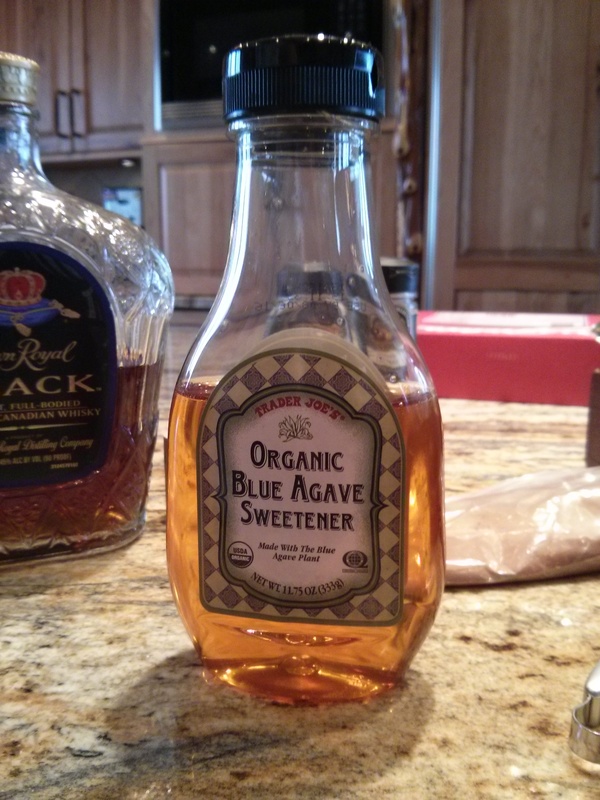 We didn’t have honey and I’d usually double that portion if we did, but Agave can be sweeter than honey. 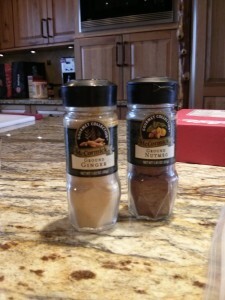 -Tapped in two teaspoons of ground ginger and a teaspoon of nutmeg. 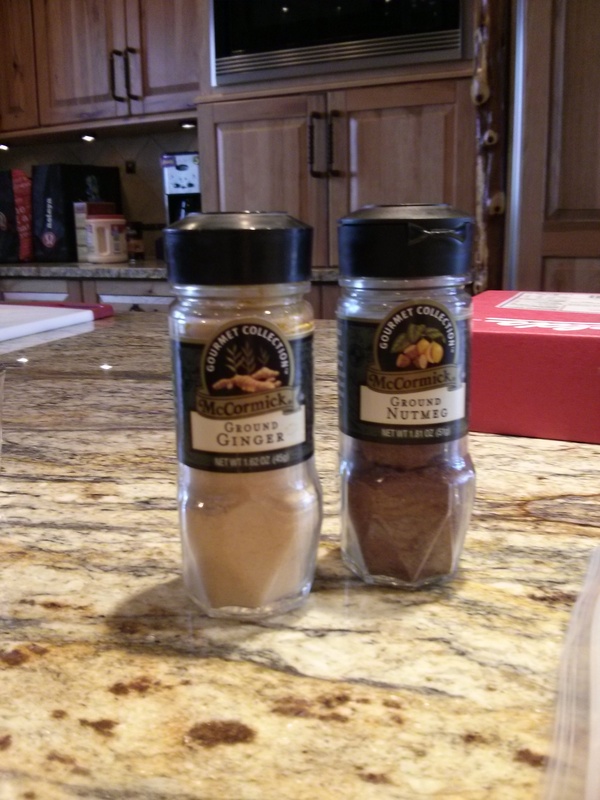 We didn’t have cinnamon sticks, so I added three teaspoons of ground cinnamon. -Heated it on medium/low for 20 minutes. You want it to get hot, but not boil.